The price of gasoline across the United States continues to rise, and the increases show no signs of topping off as the average price of a gallon of regular unleaded has jumped 15-cents since May 1st. The latest weekly gas price survey from the Energy Information Administration shows the cost of fuel lurched forward another 7 cents this past week. The U.S. average was led by huge increases in the Rocky Mountain states and in the Midwest, the latter of which is typically a harbinger of things to come in the broader U.S. market. In most Midwestern states, the cost of a gallon of gas skyrocketed by an average of 18-cents per gallon, coming on the heels of a 7-cent per gallon increase last week, which followed a nickel increase per gallon the previous week. In all, the heartland of the U.S. has seen gas prices up a quarter per gallon since the beginning of the month. Meanwhile, for truckers and other drivers with diesel engines, the cost of rolling across the highways and turnpikes has also increased, although not as dramatically. Diesel fuel prices ticked up about 2-cents per gallon in most regions, with the Gulf Coast states and West Coast witnesses increases between 4-cents and 5-cents per gallon. Gasoline prices had been declining steadily through March and April, impelling the EIA to estimate summer gas prices would settle around $3.63 per gallon through the summer; however, the current price of fuel, just ahead of the Memorial Day driving frenzy, is already $3.67, with prices at or near $4.00 per gallon in some places across the West Coast and California. But the West Coast, which traditionally has higher fuel costs than the rest of the nation, was not suffering as badly as some drivers in Minnesota and Illinois. In Minneapolis, TV station KSTP 5 reported the price for a gallon of regular unleaded was selling for as much as $4.34 per gallon Saturday, ranking it near the highest in the U.S., even ahead of Hawaii. Many drivers were interviewed on the street, relaying their particular pain at the gas pump. The rise in fuel prices has been blamed on the closure of two refineries in Chicago, as heavy rains caused problems with the refineries and pipelines that carry other fuels. With a torrent of bad weather striking across the United States Monday, including tornadic activity across Oklahoma and other Midwestern states, it was unclear how oil futures may be impacted, which could lead to further spikes in gas prices. The price of gas across the nation took a solid turn for the worse during the past week, as confirmed by the weekly fuel price survey by the Energy Information Administration. The average price of a gallon of gas in the U.S. jumped by nearly 7-cents, but the cost of a gallon of regular unleaded was up by as much as 13-cents per gallon in places like Oregon, Washington and California. The lowest price increases were seen across the East Coast, where prices were generally up about 3-cents per gallon. This week’s stark leap in the cost of fuel comes on the heels of a slow reversal in gas prices, which had been declining since the beginning of March. The May 6 EIA Survey showed prices were flat to slightly higher, a portent that a pre-summer hike in fuel prices was on the way. This week’s report confirmed that prediction. The change in prices impacted the diesel pump this week, too, which last week was unaffected by the rise in fuel costs. But, the cost to drive a rig or fleet of trucks just jumped, with prices rising in nearly all states and regions. Only the Lower Atlantic and Gulf Coast states appeared to have been spared, as prices were largely flat in those regions. Elsewhere, the average price of diesel fule was up by four and five cents per gallon in California and the broader Western U.S. markets, respectively. The average price of diesel was up about 2-cents per gallon during the past week. 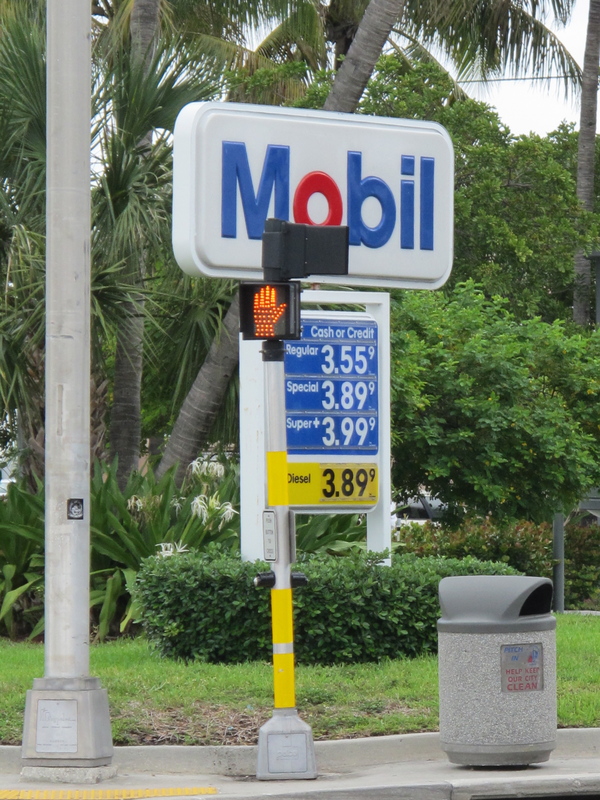 Average gas prices in some states were higher than their regional counterparts, like we found at this Fort Lauderdale gas station, located near Port Everglades. Some states found themselves in the grip of higher gas prices than their surrounding regions, which was particularly true in Florida. The average price of fuel along the Lower Atlantic and Gulf Coast regions was anywhere from $3.37 to $3.47 per gallon. However, some metropolitan areas witnessed fuel prices as high as $3.70 per gallon, for regular unleaded. 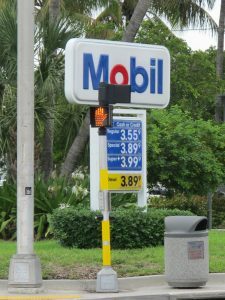 The average prices across South Florida appeared to be beween $3.55 and $3.60 per gallon, as long as drivers avoided more remote stations. The EIA had earlier this year predicted the summer price of gasoline would likely settle to about $3.63 per gallon, as a nationwide average, but that price may be due a revision, given the current spike in fuel prices. In California, for instance, the average price for a gallon of regular unleaded gas still remains around $4.00 per gallon, despite the price breaks in most other regions. Midwestern states were also well above the national average for the week, where prices hovered around $3.68 per gallon. The trend of falling gas prices across the United States came grinding to a halt during the past week, at least for most of us, as the cost of the average gallon of unleaded gas flattened out or increased in most regions. On average, the price of a gallon of gas increased by about two-cents per gallon, a charge led by the West Coast and the Midwestern U.S, according to the latest gas price survey from the Department of Energy. Midwest gas prices are often a portent of where broader national fuel prices are going next, at least when examining trend lines of recent fuel charges from the DOE’s Energy Information Administration. The EIA is predicting gas prices are likely to level off for the summer, settling into a nationwide average of about $3.53 per gallon for most of us. That would place average gas prices right about where they are now, although some volatility may still be expected. Diesel fuel prices kept declining during the past week, although in many regions the price declines were not as deep as recent weeks. For the Midwest, the frequent bellweather of fuel costs, the average price of diesel fuel went up about three-cents per gallon. Nationwide, diesel costs were flat to slightly-lower, with the average U.S. trucker enjoying a penny per gallon decline in diesel charges. Editor's note: TurnpikeInfo.com earlier had erroneously reported the EIA had predicted summer gas prices would be $3.63 per gallon for unleaded gasoline. That figure represented the 2012 pricing, not the 2013 pricing.